In History class, we were taught that civilizations all go through the same cycle: growth, development, and decay. The same goes for food/drink trends, e.g., the once-ubiquitous pearl shake stalls. A few years prior to the whole sago shake craze, there was the shawarma craze, when practically every street corner had a shawarma stall. The shawarma—bits of beef, some onions, and tomatoes rolled up in flat bread—eventually became last season’s “It” food, but thankfully, a few Persian cuisine places still remain standing. Last year alone, I think I went to at least seven different places specializing in shawarma and other Persian food (and ate at a few of them quite regularly), so yeah, you could say I am the shawarma market. 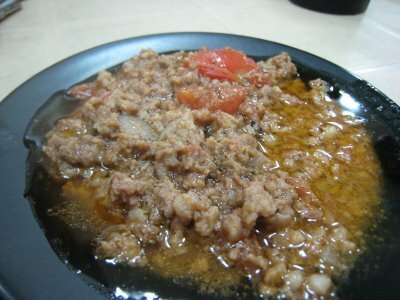 One place I keep going back to is Ababu. It used to be a hole-in-the-wall joint in Teacher’s Village in QC. I panicked one day when I saw that it was closed, but was relieved to learn that they were just in the process of moving to a more accessible location. Fast forward a couple of months: I was expecting the “new” place to be all spiffed up, but instead found the exact same Monoblock furniture in yet another hole-in-the-wall joint, only this time along Xavierville Avenue! Hilarious. The only major change was the price (no more seven-peso iced tea!). Still, the prices are reasonable, and since it’s the kind of place where people come in for a quick bite then leave (no beer served, so no tambays), service is pretty snappy. 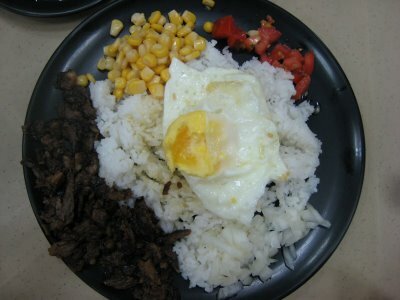 I normally get the shawarma plate–it’s a P99 meal with a mountain of buttered rice, slivers of roasted beef, chopped-up tomatoes and onions, corn, and a fried egg for good measure–served in two minutes flat. And it comes with bottomless drinks! And when they say “buttered,” they mean BUTTERED. I’ve actually seen them grate (yes, GRATE) a block of butter over the rice. Mixed emotions: I was aghast and, well, actually kind of thrilled. Everything’s better with butter on it! Sure, there are other more popular—and, I’ll admit, better—Persian places (like that huge kebab resto along West Ave.) but I seem to go back to Ababu again and again. B and I even celebrated the day of hearts there! (No overpriced meal in a paper-heart-festooned setting for us. Although the Ababu blackboard did have the words “I crush you” scribbled on it.) I love that it’s unpretentious and accessible, and the food always hits the spot. And fast! Indeed! I'm hankering for it right now. 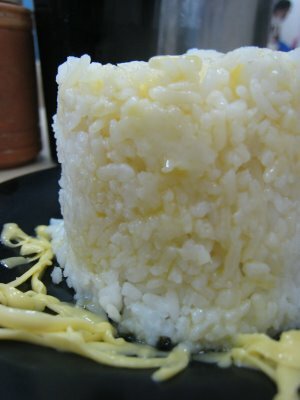 That buttered rice reminds me of the "STAR RICE" they used to feature in the Star Margarine ads. That was awesome.